Griddles and Charbroilers are a dime a dozen in the midlife crisis kitchen, but you almost never see a range with a French top. Although the grill and griddle are certainly worthwhile additions to a range top, the French top may be a better choice. A French top is basically a modern approximation of an antique coal fired range in that it gives you a full spectrum of cooking heat, from simmer to boil, on one large surface. Although they can be had in a larger size, the most common size available for the home is 24" x 24". The really nice thing about the French top is that this intuitive approach to cooking allows you to concentrate on the food without fiddling with a bunch of knobs. 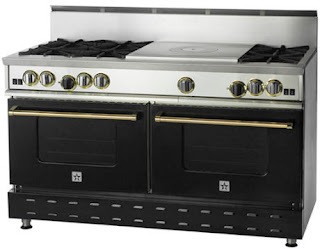 A conventional gas hob forces you to bend over and peer beneath large pots to see what the flame is doing, and since the average hob is a bit touchy, you'll need to remain in that position while adjusting the heat. With the French top, the temperature of a pot is obvious by it's position, if it's in the middle, it's hot, if it's on the perimeter, it's not - you can't get much simpler than that. I can't recall ever seeing a salamander in a home kitchen, which is odd given it's ubiquitousness in the commercial kitchen. A salamander is a top fired grill/broiler typically mounter on the back of a range, much like an over the stove microwave/hood combo. There are two really great things about the salamander, it's flexibility and it's position. In a salamander, you can cook anything from Creme Brulee to Scrod, try that with your char grill. 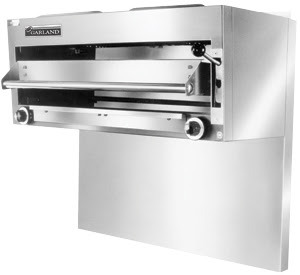 The eye level position of the salamander's grill allows you to closely monitor the cooking process. For most people, the salamander is definitely overkill, but if you really want to bang out food they really can't be beat. Frankly, I don't know why every home doesn't have a potfiller, it seems like such a no brainer and it's not like they cost a million bucks. 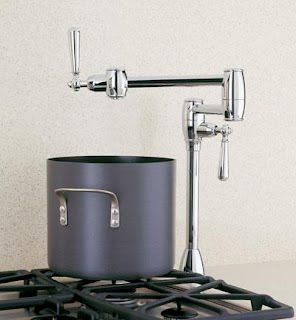 A faucet by the stove, what's not to like?